Most people volunteer time or resources to a worthy cause at some point in their lives. We all have our own reasons for volunteering, but a common theme is the desire to help foster positive change. I recently had the opportunity to volunteer as a server at FareStart during their incredibly popular Guest Chef Night program. The experience was unparalleled and the impact was unforgettable. 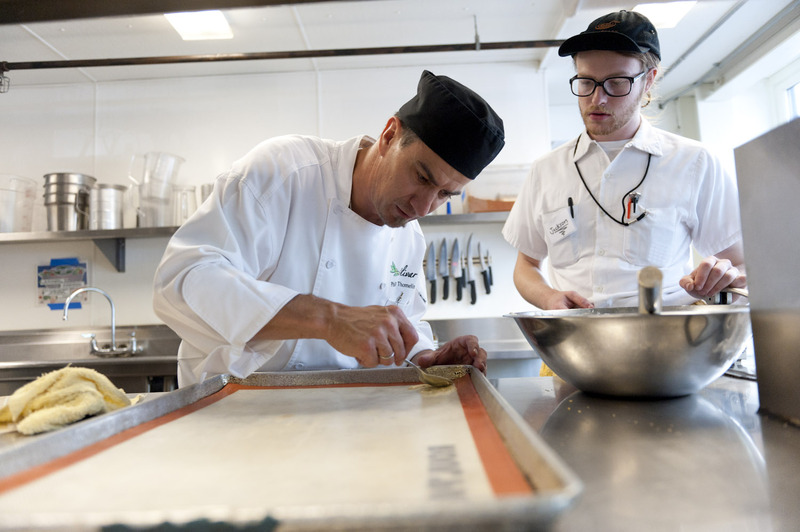 Having seen an opportunity to bridge the gap between homelessness and employment, FareStart opened its doors in 1992. It transforms lives by empowering homeless and disadvantaged men, women, and families to become self-sufficient through life skills, job training and employment in the food service industry. To the public, a weekly reminder of the impact FareStart has on lives is their weekly Guest Chef Night. High profile chefs from every iconic restaurant in Seattle have volunteered their time and resources the last 20 years to help make these evenings special. Companies, teams, clubs and groups of all kinds have volunteered as servers, helping ensure all profits from the dinner go directly back into the educational program at FareStart. More than 200 meals are served on these nights—all under the direction of that evening’s guest chef and the current team of students. As a proud alum of Washington State University, I belong to a local alumni group and I’m happy to share we’re active in the community. The opportunity to volunteer at FareStart opened up and we jumped at the chance (the current waiting list for groups to volunteer at Guest Chef Night extends into 2014!). To my surprise, the evening we volunteered happened to coincide with the graduation of a couple students from the FareStart program. The restaurant began to fill and the noise level rose. Naturally, I tried to channel my skills as a server from high school and college. It didn’t work and I was a flustered mess all night. After it was clear that the first few patrons didn’t seem bothered by my slow service and complete disorganization, I started to realize that everyone in the restaurant that night was there for something more substantial than dinner. Half way through the evening service completely stopped for 15 minutes. It was incredible. The entire restaurant was on pause and the spotlight turned to two graduates, both gentlemen in their 40s, who had completed a 16-week transformation that I can’t imagine anyone else being able to truly comprehend. Their remarks were emotional and the perspective they had on a newly found life was insanely powerful. After service was complete, our team of volunteer servers sat down for dinner as well. We ate with FareStart’s management and regular wait staff (the restaurant is open for lunch Monday-Friday from 11am-2pm), who had assisted our alumni group all night. We learned about how FareStart has impacted them and why they’ve remained there—many of them for 10 years or more. Having thought about my experience that evening, it was no surprise to learn that every employed server I talked to had started in my shoes, as a volunteer on Guest Chef Night.